It's fair to say we were fairly impressed with the AMD Radeon HD 7970 3GB GHz Edition when it was released a few months back. 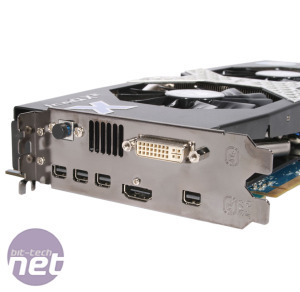 It proved itself to be consistently faster than the Nvidia's fastest single GPU, the GeForce GTX 680 2GB, although it was also more power hungry and nosier. With many beginning to wonder if the long expected HD 7990 6GB will ever make an appearance, the HD 7970 3GB Ghz Edition is currently the fastest card in AMD's armoury. 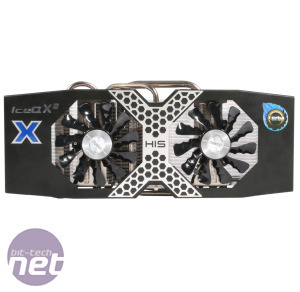 With their X Turbo edition, HIS has taken this card and made it even faster, as well as adding some new cooling and features too. Even so, the £460 asking price is steep, and the card will need to pull out all the stops if it's going to justify it. 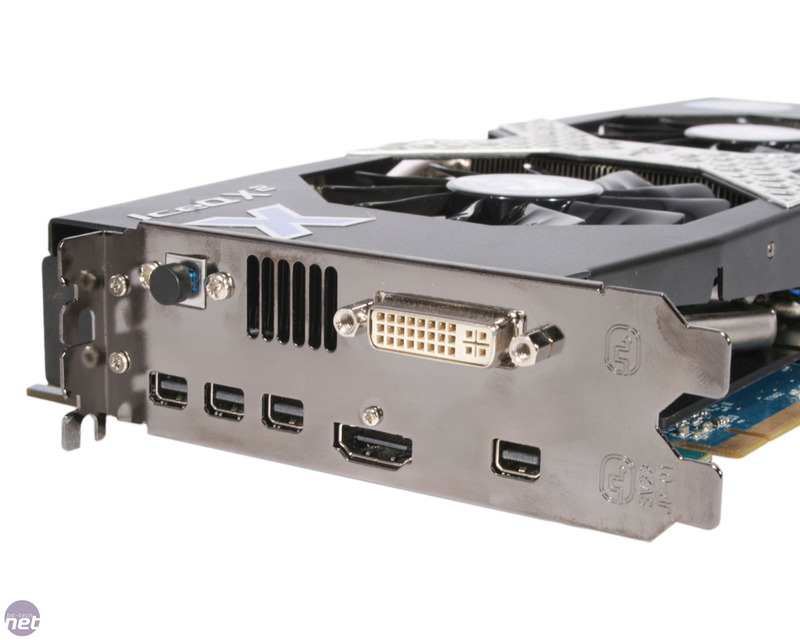 The actual GPU of the X Turbo is the same as all other HD 7970 3GB cards, meaning that it retains the 2,048 stream processors, 128 textures units and 32 ROPs of the original card. Where the X Turbo differs from the original and the GHz Edition is in its core clock speed, which has been ramped up to 1,120MHz, with a boost clock of 1,180MHz, which is a pretty significant overclock – we were only able to push the boost core clock of our GHz edition card to 1,175MHz. Whereas AMD also overclocked the memory for their GHz Edition of the HD 7970 3GB, HIS have chosen to leave the 3GB of GDDR5 memory clocked at the same 1.5GHz (6GHz effective) clock speed that featured on the GHz Edition, giving it the same memory bandwidth of 288GB/sec. 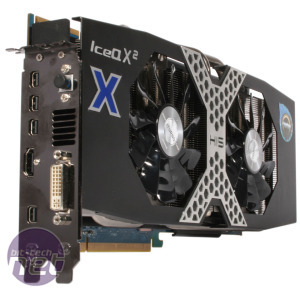 It's a powerful card, no doubt, but just in case that wasn't enough, there's also support for up to four way Crossfire, in case anyone is mad (read: awesome and wealthy) enough to stick four of these beasts in a single rig. 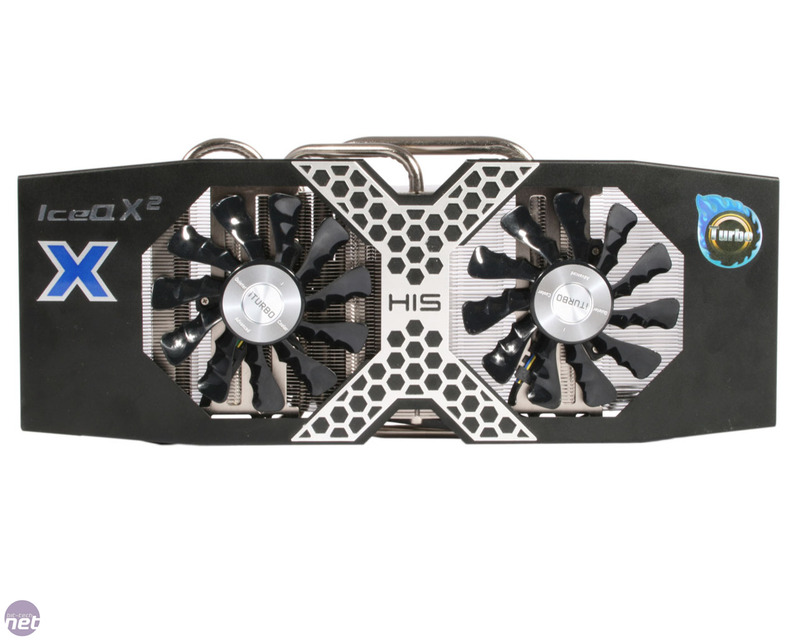 Externally, the X Turbo is very different to the card its based on, however. HIS has added two extra mini-display ports to the original's two, which is on top of a one HDMI and a dual-link DVI connection too. The button on the rear I/O is used to switch the card between five and six display settings, as the card supports both. Pressing it in will turn the DVI connection into a single-link connection, enabling six screen Eyefinity support in the process, which is a neat little feature. Gone also is the red and black cooler that's so associated with AMD cards. 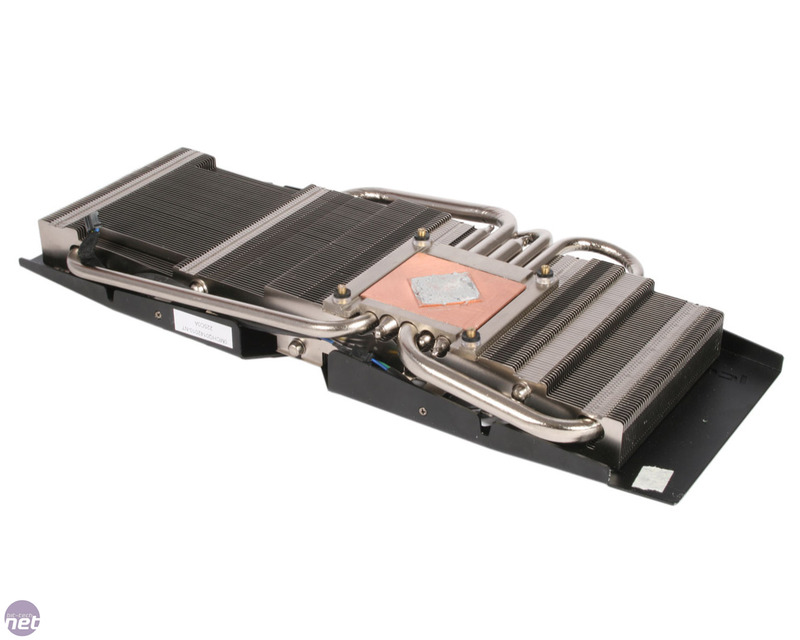 In its place is HIS's own black and silver IceQ X2 cooling solution, which consists of dual 89mm fans which blow cool air down onto the large array of fins. 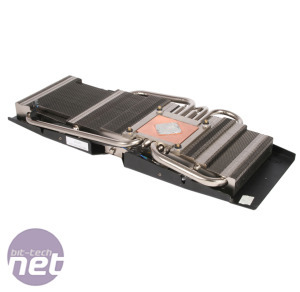 Five heatpipes draw heat away from the GPU and into the fin stack, and a metal plate with foam contact plates does the same job for the memory chips and much of the power circuitry too. 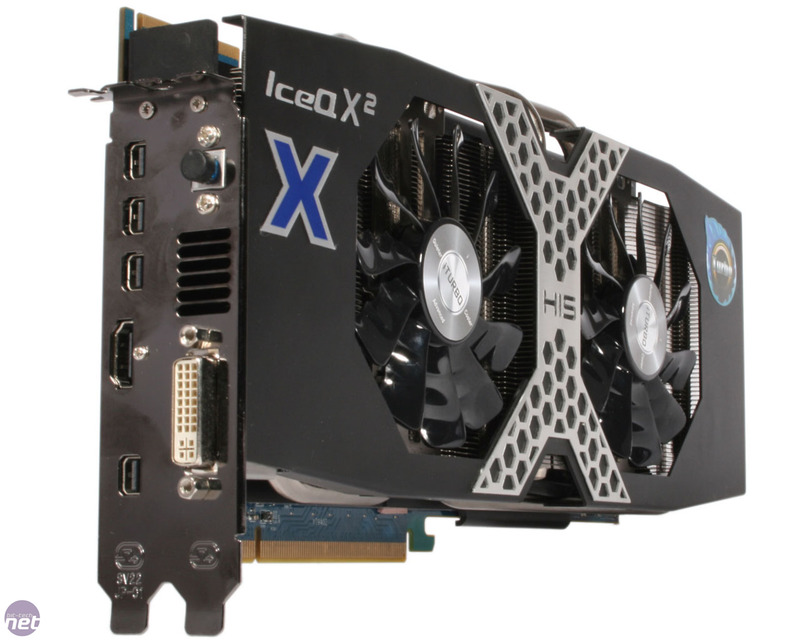 Keen-eyed readers will note that unlike the standard HD 7970 3GB cooler, the IceQ X2 cooler actually exhausts most of its heat back into your case, and it also extends the length of the card from 275mm to 310mm. The layout of the PCB is similar to the GHz edition reference card, although not identical. The GPU still sits in the middle of the card surrounded by the twelve 256MB memory chips. Most of the power circuitry still resides on the right side of the PCB, but HIS has siginificantly increased the 5+1+1 power phases of the original card to a whopping 18+1+1, and these are complemented by the inclusion of two top-mounted 8-pin PCI-E connectors, in place of the original 8-pin and 6-pin combo. Despite the already large overclock, then, we were hopeful that the improved power circuitry would mean the X Turbo still had even more to give. One final addition from HIS is the series of LEDs on the top side of the cooler. There are two sets, one of which changes between green yellow and red based on the amount of voltage being used by the card, and one which changes between five colours based on the current fan speed. However, the voltage indicator simply changed to red any time the card was under load, and the fan speed indicator seemed equally useless – generally changes in fan speed can be observed with ears rather than eyes. 28nm mobile parts boast impressive performance. With hopes of an official HD 7990 fading fast, Club 3D steps up. How does its monstrosity perform?